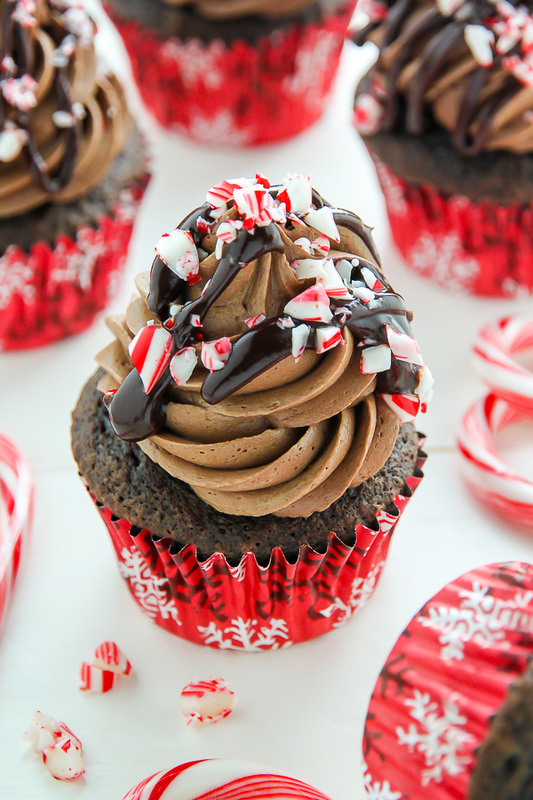 Supremely moist and decadent chocolate cupcakes topped with peppermint mocha frosting, a drizzle of chocolate ganache, and crushed candy canes. 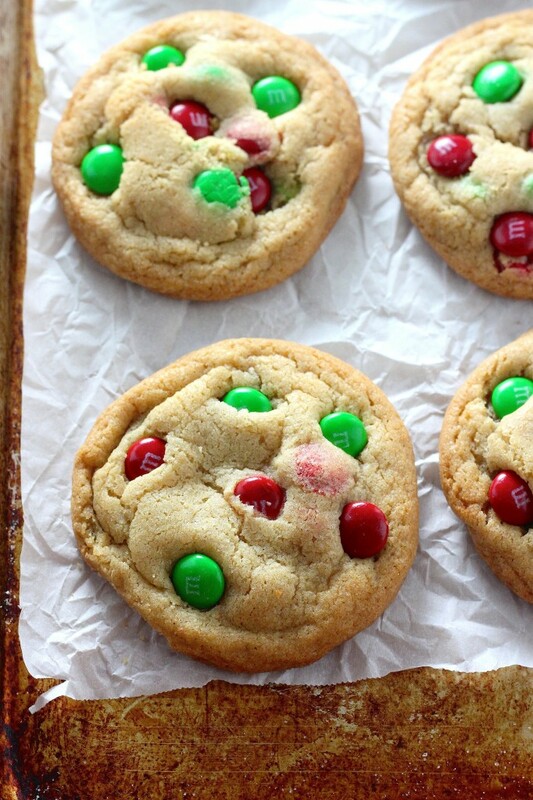 ← Can you think of a sweeter way to kick off the holiday season? I’m a huge fan of “Christmas flavors”. You know… the ones we look forward to indulging in all year long. Like eggnog, gingerbread, cranberry, snickerdoodle, pumpkin, and of course, peppermint mocha. I love them all! But peppermint mocha may be my favorite… I blame Starbucks and their addicting peppermint mocha lattes. Have you had one yet this year?! I got my first fix of the season last week and each sip was as sweet as I remembered. Chocolate + peppermint + mocha = so much yum. ↑↑↑ Today’s recipe includes all of those wonderful things. So let’s get down to details. I know many of you cringe at this word… but I’ve got to say it. These cupcakes are supremely moist! In fact, I will go as far as to say they are the most tender cupcakes I have ever bitten into. And these chompers have bitten into many cupcakes! P.S. If you’d like to make these cupcakes ahead of time – you totally can! These cupcakes may be frozen, unfrosted, for up to a month. Holiday party planning just got a whole lot easier, eh? 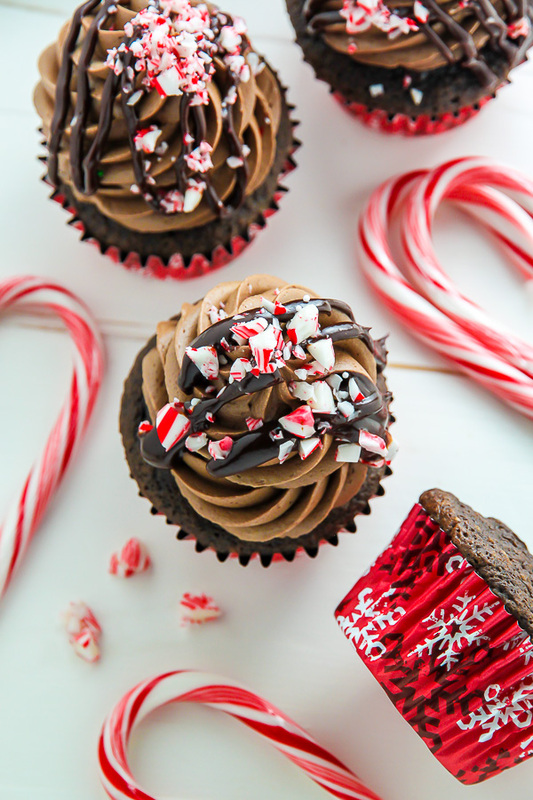 These cupcakes are topped with a rich peppermint mocha frosting that sounds (and tastes) a whole lot fancier than it is. In reality, it’s quite simple to make! Just a few basic ingredients whipped up until smooth and creamy. The key to making bakery style frosting at home? Soft butter. You’ll want to leave your butter out on the counter for at least 30 minutes before beating it smooth. It should be a little softer than room temperature. 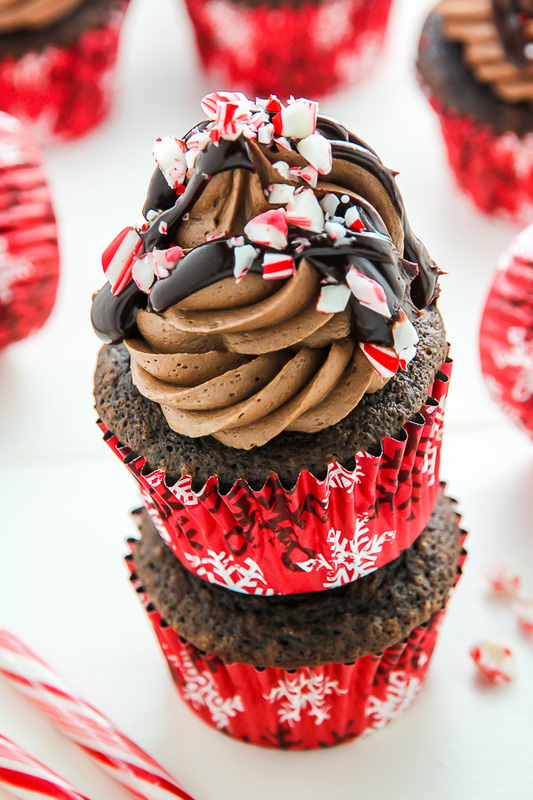 Finished with a drizzle of chocolate ganache and sprinkle of crushed candy canes, peppermint mocha chocolate cupcakes have plenty of pizzazz. 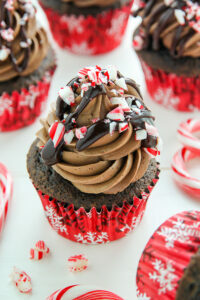 These peppermint mocha cupcakes are sure to perk up any dreary Winter day. 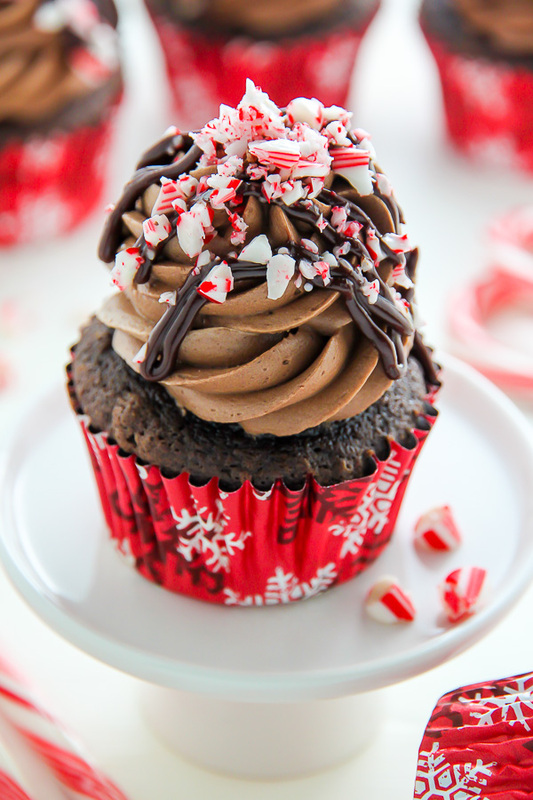 Super moist and decadent peppermint mocha cupcakes are topped with chocolate peppermint frosting and crushed candy canes! Perfect for the holiday season. Preheat oven to 350 degrees (F). Line a 12-cup cupcake/muffin tin with cupcake liners and lightly spray the liners with non-stick spray (optional but it does help them peel right off). Set aside. In a large, microwave safe bowl, melt the oil, butter, and chocolate in the microwave, heating in 30 second increments, and stirring in between each increment, until completely melted. Whisk mixture until completely smooth and set aside to cool. In a large bowl whisk together the eggs, yolk, sugar and peppermint extract; beat until smooth. Add the cooled oil/butter/chocolate mixture and whisk until smooth. Add half of the flour mixture, then half of the sour cream. Repeat the process until everything is added, and be sure to mix until JUST combined. Quickly stir in the hot coffee - it's important not to over mix, here! Just stir until everything is evenly combined. Fill the prepared cupcake liners so that each mold is 3/4 of the way full (you'll have some leftover batter). Bake for 16-18 minutes, or until a toothpick inserted in the center comes out clean. Cool cupcakes in the pan for 10 minutes, then transfer to a cooling rack to cool completely. Repeat with remaining batter. Using a handheld mixer OR a stand mixer fitted with the paddle attachment, beat the butter on medium-high speed until creamy; about 2 minutes. Reduce speed to low and slowly add the sifted sugar/cocoa powder, alternating with the sour cream and half and half, then add the peppermint extract and salt. Once all of the ingredients have been added, increase speed to medium-high and beat the frosting until fluffy, about 2 minutes. Frost cooled cupcakes and top with chocolate drizzle and crushed candy canes. Place chocolate in a medium-sized heat-proof bowl; set aside. In a small saucepan over medium heat, warm the heavy cream until very hot, but not boiling. Pour the hot cream over the chopped chocolate and set it aside for 2-3 minutes. Whisk the cream and chocolate completely smooth; whisk in vanilla. Allow the chocolate to cool for about 5 minutes before spooning the on the top of each frosted cupcake. 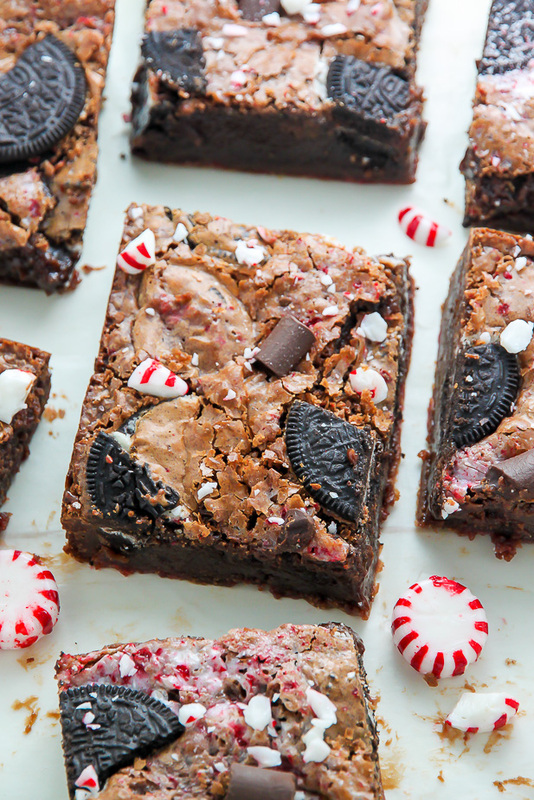 Sprinkle the wet chocolate with crushed candy canes. 1) Do not let the chocolate glaze sit for more than 5 minutes or it will harden up and become very difficult to spoon over the frosting. 2) Don’t add too much chocolate glaze or it will drip all over your liners making it very messy to pick up. 3) This recipe makes 12 very large cupcakes. You can make 16 smaller cupcakes, if desired, but reduce the bake time by 2-3 minutes. These cupcakes look fantastic! Irresistibly good! Hello from Australia! Your photos are simply stunning I have to say. I am no baker but you convinced me to try these cupcakes and I was not disappointed. SO fluffy and chocolatey and delicious. My mum thought they were from a bakery because I decorated them like yours in the photos. I wish I could show you! Thanks again for making me feel like a baker. Jemma, Thank you! I am so happy you enjoyed the recipe. These chocolate cupcakes are one of my favorites! oohhhhhh you make the prettiest cupcakes!!! I love how perfect these are for Christmas!!!! Hollis, thank you so much for this comment – it made my night! I’m so happy this recipe could help you impress your friends 🙂 Now I’m craving a cupcake…! I am wondering what Nozzle you used for these? 🙂 Can you provide an image? Or name please? By the way your photos are amazing, I bet it taste so much better as well! Hi! I’m hoping to make these this weekend but curious if they peak in the middle or come out flat? Do they fluff up? I need to make 3 dozen so any idea of how much to fill the liners would be a huge help! Thank you for this amazing recipe! I followed it exactly (cupcakes only, topped them with whipped mint chocolate ganache) and they came out extremely moist and delicious! They rose beautifully and peeled from the greased liners well. My only “complaint” was that I had enough of this batter to make 2 dozen cupcakes; my husband is thrilled. 😉 I’m new to your blog but I will definitely be subscribing! I’m an experienced baker, but it’s been a long time since I’ve made cupcakes. I had some leftover crushed peppermint candy to use and this picture inspired me to get back into the cupcake game. I did make two minor changes (at least I thought they were) – I used dark cocoa powder (because that’s what I had on hand) and I didn’t have peppermint extract so I used triple the amount of peppermint schnapps. The cupcake tins were filled to the top, but the recipe said 12, so I went with it. They ended up with mushroom tops and ran into each other. At 16 minutes they were nowhere near done, nor at 18 minutes. I added another 5 minutes to finish them off. I think this would have been better as 13 cupcakes (which still leaves a nice dozen after the cook samples one). Have the size of cupcake tins been super-sized in the last 10 years? The frosting was very stiff (the butter had softened for more than an hour) and I kept adding more liquid to it. I put the crushed peppermint on the frosting the night before. When I brought them to work the next day, the peppermint had kind of melted and gotten chewy. I seem to recall that happening to me in other recipes with crushed peppermint. I gueess you have to make them and eat them on the same day. Do these cupcakes have to be refrigerated? I would recommend it if you’re not planning on serving them within a few hours of baking. I’d also suggest bringing them to room temp before serving. Has anyone tried using hot cocoa instead of hot coffee? I’m not a coffee drinker, but I LOVE hot cocoa.